The days of set times where employees take classes to learn the skills, behaviors, and knowledge to move your company up the ladder to success are quickly fading in the digital age of the 21st century. Meeting the eLearning needs of your company in a rapidly-changing environment where it seems no one has the time to engage in learning, not to mention your time in developing and rolling out eLearning programs. Never has it been more important to pay attention to coming up with eLearning modules and courses that fit quick pace of corporate life. That’s why this article is about bite-sized eLearning. The whole idea of chunking learning into smaller more manageable pieces shouldn’t be thought of as some kind of revolutionary new concept. After all, isn’t this what people have done with business goals and projects for decades? You set a goal or project, and then figure out the smaller action steps that that will get you there. Bit-sized eLearning is taking that project and goal knowledge from the realm of management and making sure it gets executed in the eLearning environment as well. Steven Rice, vice president of human resources for Juniper Networks, learned this lesson when the company was in the midst of overhauling its performance management system. He quickly realized that the company’s approach to learning also needed some tweaking to better support the new environment. As he puts it, “People want information and content when they need it versus when there’s a class available, so in our learning space, we’re breaking a lot of our content into what we call molecules” (source). If, for example, a manager was getting ready for a coaching conversation but wanted to bone up on how to do it well, the old system would have involved attending a communication class on a set date. In the new system, however, the manager can access a YouTube video that walks them through the basics in a matter of minutes. That’s a great example of how learning needs to take place in the digital age of the 21st century. Through countless hours of instructional design, field testing, and client feedback, I have found that 30 minutes is about the maximum, and less than 15 is too short. The exact number of minutes between 15 and 30 should be dictated by the depth and number of objectives in the learning module. In a one-hour course, it’s absolutely fine to have two 18-minute modules and one 24-minute module. Do what feels right. Test it with members of your target audience, and then fine-tune each module until it’s just where you want it (source). Keep in mind that the more focused or targeted your learning objective, the more likely it will translate into changed behaviors in the workplace, which is the ultimate goal of all your eLearning efforts. The moment you start cramming too much content into a given module or course, the more likely you are to overwhelm your learners. Consequently, the effectiveness of your eLearning content plummets. This bite-sized approach to eLearning design can also be applied to your own eLearning development efforts. You can’t tackle every aspect of superior eLearning in each and every module you develop, so take the bite-sized approach in what one or two aspects will get the full treatment in any given eLearning program you’re developing. This is important to keep in mind given some of the latest research on how long it takes to develop an hour of eLearning content. In surveys conducted by the Association for Talent Development in 2009, one hour of highly-interactive eLearning content can take 136 hours of work to create, and that’s on the low end. The high end is more than 300 hours (source). 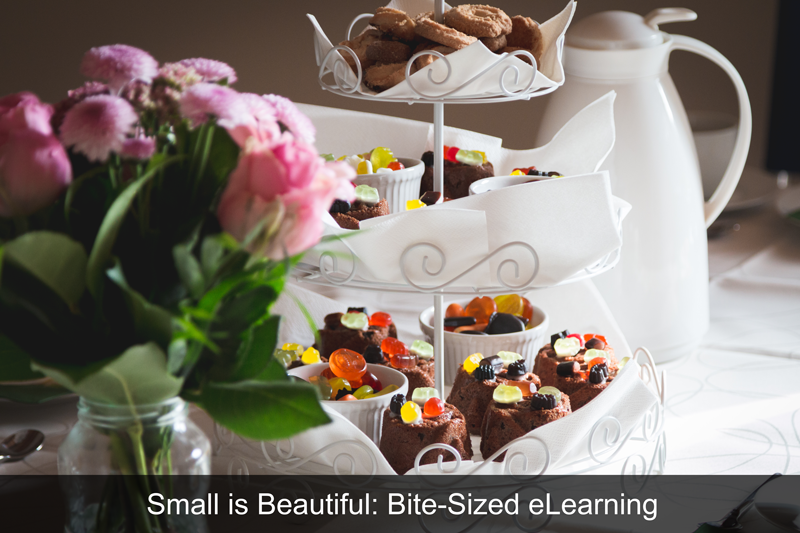 The concept of bite-sized eLearning makes sense, not only for the learners you’re serving, but also for your own time developing the content.